Are you looking for a huge park-like yard! 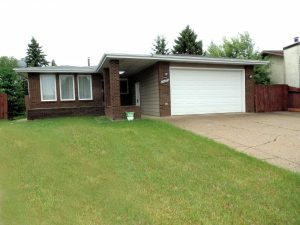 Welcome to this 1445 square foot bungalow located in a quiet cul de sac in the Menisa Community. This home features good sized formal livingroom and dining room, bright kitchen with large eating area, main floor family room with wood burning fireplace and patio doors leading to deck and very large south facing landscaped backyard. Master bedroom with en-suite, 2 additional good sized bedrooms and main bath complete the main level. All main floor windows have security roll shutters. Basement is fully developed with large 40’ x 15’ recreation room, great for entertaining, big bedroom, 3 piece bath, laundry room and storage room. Double attached finished garage and extra parking for RV on the west side completes this family home. Pack up and move right into this bright and light home.